Designed and hand-built to order in Norfolk using only the finest FSC® certified Scandinavian Redwood timber, this attractive, quality Garden Shed was recently installed for a customer based in Blackwater, Surrey. Selected by our customer from our vast range of garden sheds, the building was then delivered and assembled at the specified address by our in-house installation experts. Designed and made to order at our Norfolk factory, this attractive Superior Shed was recently installed for a customer based in Ewhurst, Surrey. Selected from our range of FSC® certified timber garden sheds, the building was delivered and installed by our expert, in-house installations team. This stunning Holkham Summerhouse was recently installed for a customer based in Busbridge, Surrey, to use as a retreat for the bottom of their garden and an outdoor storage space rolled into one. Designed and hand-built at our Norfolk factory, the building was then both delivered and installed by our in-house installations team. This charming Classic Shed was selected by a customer from our range of FSC® certified timber sheds and then delivered and installed at their address in Hindhead, Surrey by our in-house installation experts. Designed at our Norfolk factory, the building was hand-crafted to order. Designed and built by hand at our Norfolk factory, this large timber garden shed was recently installed for a customer based in Frimley, Surrey. Chosen for its high quality and abundance of storage space, the shed was also delivered and assembled at the customer’s address by our team of in-house fitters. This attractive 2.4 x 3.6m Superior Shed was recently installed for a customer based in Palmers Cross, Surrey. Designed and built to order at our Norfolk factory, the shed was both delivered and installed by our in-house team of fitters as part of our standard service. One of our charming National Trust Sheds was recently installed for a customer based in Plaistow, Surrey. Selected from our traditional range of National Trust Sheds and Summerhouses, this Felbrigg Shed was designed and built by hand at our Norfolk factory with the characterful local properties of the Trust in mind. Alike all our timber buildings, the shed was both delivered and assembled at the customer’s address in Plaistow, Surrey, by our in-house installations team. One of our timber corner summerhouses was recently installed for a customer based in Bramley, Surrey. The building was designed and hand-built by experts at our Norfolk factory using FSC® certified timber and includes free delivery and installation by our fitting experts as part of our service. This handsome timber garden shed was recently installed at a customer’s address in Rudgwick, Surrey. Designed and built to order at our Norfolk factory using only the finest FSC® certified Scandinavian Redwood timber, the wooden garden shed was then both delivered and assembled by our in-house installation experts. This charming and traditional timber summerhouse was recently installed for a customer based in Hascombe, Surrey. The distinctive octagonal Wiveton Summerhouse was designed and hand-built at our Norfolk factory using only FSC® certified timber and then both delivered and installed at the customer’s address by our in-house installations team. One of our traditional Wiveton Summerhouses was recently installed for a customer based in Hambledon, Surrey in a customer’s stunning garden among the vast variety of flora and fauna. The distinctive octagonal wooden summerhouse was designed and built at our Norfolk factory and then both delivered and assembled at the customer’s address by our in-house installations team. One of our stunning superior garden sheds was recently installed for a customer based in Shalford, Surrey. Designed and hand-built at our Norfolk factory using only the finest FSC® certified Scandinavian Redwood timber, the building was delivered and installed by our in-house fitting team. Fabricated using only the finest FSC® certified Scandinavian Redwood timber and expert craftsmanship, this Cley Summerhouse was recently installed for a customer based in Coulsdon, Surrey. Designed and hand-built at our Norfolk factory, the building was then both delivered and installed at the customer’s address by our in-house installations team. Selected from our range of FSC® certified Scandinavian Redwood Garden Buildings, this Blakeney Summerhouse was recently installed for a customer based in Chiddingfold, Surrey. Designed and hand-built at our factory in Norfolk, the building was then delivered and assembled at the customer’s specified delivery address by our in-house installations team. Selected from our range of FSC® certified Scandinavian Redwood timber Garden Sheds, this Superior Shed was recently installed at a customer’s address in Cobham, Surrey. Designed and hand-crafted by experts at our Norfolk factory, the building was assembled at the delivery address by our in-house installations team. One of our truly timeless Summerhouses was recently selected from our range of FSC® certified Scandinavian Redwood timber Garden buildings by a customer based in Horsham, Surrey. Boasting free delivery and installation by our team of in-house fitters, the building was designed and hand-built at our factory in Norfolk. A stunning and stylish addition to their landscaped garden, one of our customers recently selected this Burnham Garden Studio from our range of FSC® certified Scandinavian Redwood timber buildings. Measuring 3.0 x 4.8m, the studio was designed and hand-built at our Norfolk factory before being both delivered and assembled at the customer’s address in Aldershot, Surrey by our in-house installations team. Selected by a customer from our range of stunning FSC® certified Scandinavian Redwood timber buildings, this modern Garden Studio was designed and hand-built at our Norfolk factory. As part of our exceptional service, the building was then delivered and assembled at the customer’s specified delivery address by our in-house installations team. One of our charming Blakeney Summerhouses was recently installed for a customer based in Halsemere, Surrey, as a quiet retreat for the bottom of their garden. Fabricated entirely from FSC® certified timber, the Summerhouse was designed and built at our factory in Norfolk before being both delivered and installed by our expert, in-house fitting team. This charming Wiveton Summerhouse was recently installed for a customer based in Aldershot, Surrey, as a quiet retreat for the bottom of their beautiful garden. Measuring 3.0 x 3.0m, the building was hand-built by expert craftsmen at our Norfolk factory before being both delivered and installed by our expert, in-house fitting team. Recently installed for a customer based in Camberley, Surrey, this stunning FSC® certified timber Salthouse Studio was designed and built at our factory in Norfolk before being both delivered and installed by our in-house, expert fitting team. The building measures 2.4 x 3.6m, which is one of several sizes available. Selected by a customer from our range of stylish Garden Studios, this Salthouse Studio was recently designed and built at our Norfolk factory before being delivered and installed at the customer’s address in Sunbury-on-Thames, Surrey. One of our charming Greenhouses was recently installed at a customer’s address in Godalming, Surrey. Designed and built by hand at our Norfolk factory, the Greenhouse is from our range of stunning FSC® certified timber buildings that range from Summerhouses through to Garden Sheds. This stunning Salthouse Studio was recently installed for a customer based in Surrey. Selected from our superior quality range of FSC® certified timber Garden Studios, the Salthouse was designed and hand-crafted at our Norfolk factory before being both delivered and installed by our expert, in-house fitting team. This stunning Blakeney Summerhouse was recently installed for a customer based in Ewell, Surrey who selected the model from our range of stunning Summerhouses. Designed and built at our Norfolk factory, the summerhouse was fabricated entirely from FSC® certified timber and was delivered and installed by our expert, in-house fitting team. This attractive and traditional Blakeney Summerhouse was recently installed for a customer based in Esher, Surrey. Designed and built by hand at our Norfolk factory, the building was fabricated entirely from FSC® certified timber. It was then delivered and installed by our expert, in-house fitting team at the customer’s specified address. 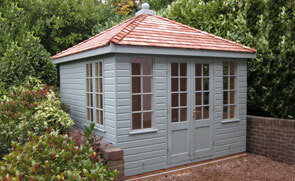 This attractive National Trust Ickworth Summerhouse was recently installed for a customer based in Redhill, Surrey. Selected from our range of buildings inspired by the historical sites preserved by the National Trust, the summerhouse was designed and built at our Norfolk factory before being delivered and installed at the customers’ address. One of our attractive Holkham Summerhouses was recently installed for a customer based in Chichester, Surrey. As with our entire range of Summerhouses, this building was designed and hand-crafted at our Norfolk factory using only FSC® certified timber, before being delivered and installed by our expert, in-house fitting team. This quaint Lavenham Summerhouse was recently selected by a customer from our National Trust range of sheds and summerhouses and was delivered and installed by our expert fitting team at their address in Horely, Surrey. As with all our FSC® certified timber buildings, the summerhouse was designed and hand-built in Norfolk. This 3.0 x 6.0m Salthouse Studio was recently installed for a customer based in Walton-on-Thames, Surrey. The building was designed and hand-built at our factory in Norfolk before being delivered and installed at by our expert in-house fitting team as part of our exceptional service. This convenient 1.8 x 3.0 Classic Shed was recently installed for a customer based in Bagshot, Surrey. The customer needed a practical, high-quality and durable timber shed and wanted a pent roof so that it didn’t protrude too far over the neighbouring fence. 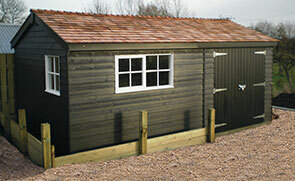 We recently installed this charming Superior shed in stunning Surrey, in the area of Shortheath. 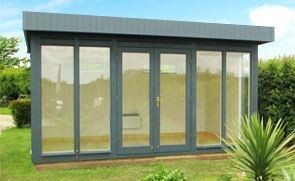 Truly tailored to the individual requirements of our customer, this model is a unique, non-standard size of 1.8 x 4.7m. 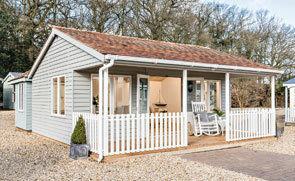 Set in a lovely rural area with plenty of greenery, it is the perfect garden retreat or storage solution. This attractive Superior Shed was recently installed for a customer based in West Byfleet, Surrey. Measuring 3.6 x 6.0m and offering 2 alternative entrances, it’s the ideal workshop and storage space for many kinds of professions. This striking Cley Summerhouse forms part of our larger range of FSC® certified Scandinavian Redwood timber garden summerhouses - each of which include delivery and installation by our specialist in-house team of fitters. Designed and hand crafted to order at our Norfolk factory, the building was truly tailored to the requirements of our customer throughout the design process. Located in the corner of our customer’s garden in Shalford, Surrey, this 2.4 x 3.0m Wiveton Summerhouse has been installed for the customer to use as a sheltered, comfortable spot to enjoy relaxing with a cup of tea and a book.